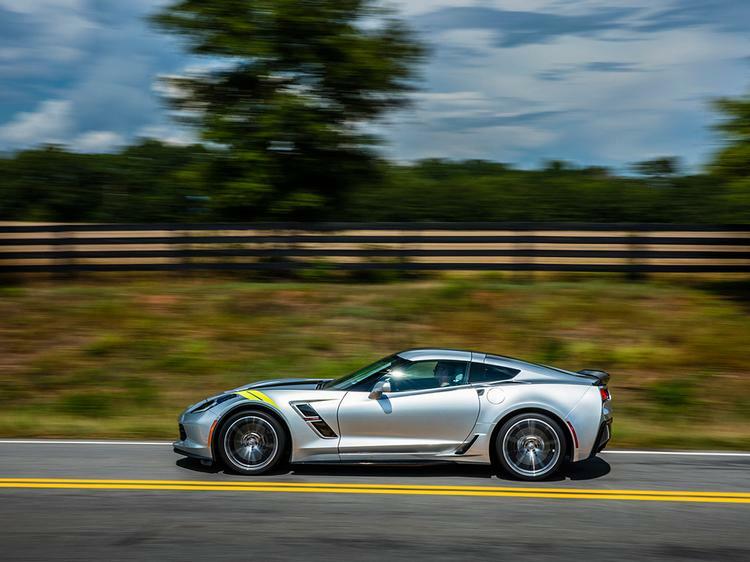 Does the Stingray engine and (most of) the Z06 chassis make for the best C7 Corvette you probably can't buy? 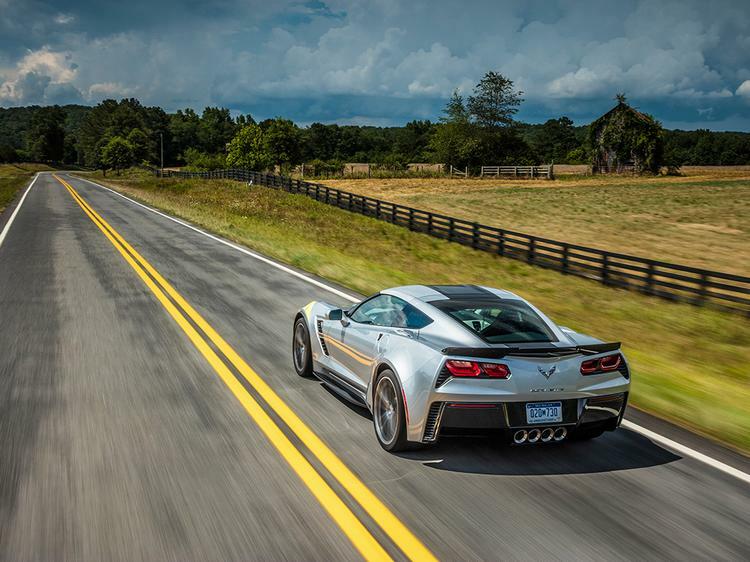 Writing about a Corvette for a British audience is a bit like trying to pen a review of the Lunar Rover. Both are strange, esoteric machines. Ones that - although we're aware of their existence - have almost no chance of crossing our paths. Officially it is still possible to buy a Corvette in the UK, although the Dealer Locator page on the Chevrolet website now has more tumbleweed than actual outlets. Indeed, there seems to be only one sales operation left - Ian Allen in Surrey. 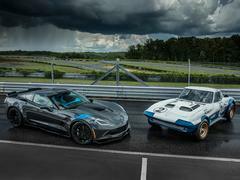 Yet even before sterling's recent plunge against the dollar the 'vette has always struggled to gain any ground in Europe, thanks mainly to the need to offset import costs against miniscule sales. Back in the States the Stingray is priced hard against an entry-level Cayman, whereas in the UK it's most of the way to 911 money. And that's with the steering wheel on the wrong side. But the Corvettes that have made the long trip to Blighty have always faced another problem. It's that tomato/tom-ay-to thing - they just don't translate that well. I've driven functionally identical C7 'vettes on both sides of the Atlantic and have experienced this geographic schizophrenia at first hand. Hoovering up a desert road in New Mexico with the V8 blaring the Corvette feels planted, fast and thrilling. Asked to deal with a wet Tuesday on the B660 it's suddenly a big, crude handful. So it's probably a good thing that, having driven the new Corvette Grand Sport in the US, there's minimal chance I'll get to experience it in Britain. Because in rural Michigan I absolutely loved it, and I'd hate for anything to cloud the memories of this holiday romance. Porsche runs the Porsche 911 model strategy like a military timetable, with a new variant or go-fastered version pretty much once a month. GM marches to a far slower drumbeat. 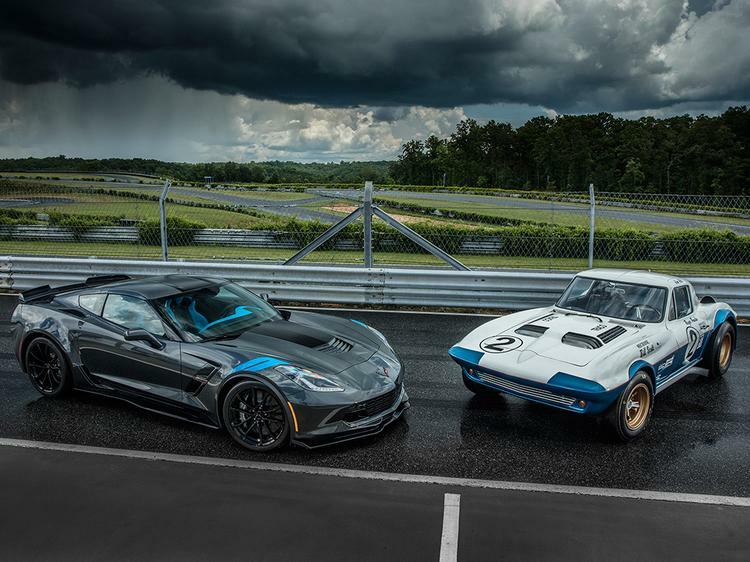 The standard C7 Stingray was launched three years ago, the supercar humbling Z06 followed in 2016, and now the Grand Sport arrives as the third model variant, sitting in the middle of the range and pretty much splitting the difference. 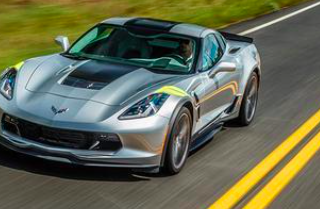 So while it sticks with the regular Corvette's naturally-aspirated 6.2-litre V8 - yes, the one that still features pushrods - it gets the brash bodywork and much of the reworked chassis hardware of the Z06. That means a mere 460hp, a number that only really looks inadequate when compared directly with the Z06's 650hp, with the official 3.8sec 0-60mph time proving the continued vitality of the GS's power-to-weight ratio. Buyers can also chose to add what's called the Z07 pack, an option that brings carbon ceramic brakes and Michelin Pilot Sport Cup 2 tyres. On top of that there's also a Stage 2 aero pack available, adding super-aggressive vanes and winglets. 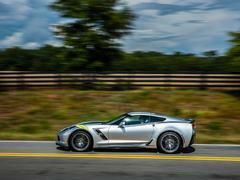 Together they pretty much turn the Grand Sport into a naturally-aspirated version of the Z06. The Corvette remains one of the cars you could identify while blindfolded, certainly if you've ever experienced one. Firstly, because you're almost certain to bang your head on the way into the tight-fitting cockpit, GM refusing to acknowledge that the average American man is getting on for twice the size as when the original 'vette was launched in 1953. But mostly because of the smell, an evocative aroma of glassfibre and resin that rises up as soon as the door is opened. It's similar to the scent that TVRs give off, but subtly different. GM could bottle it; it would go well with a half-open shirt and a big gold medallion. 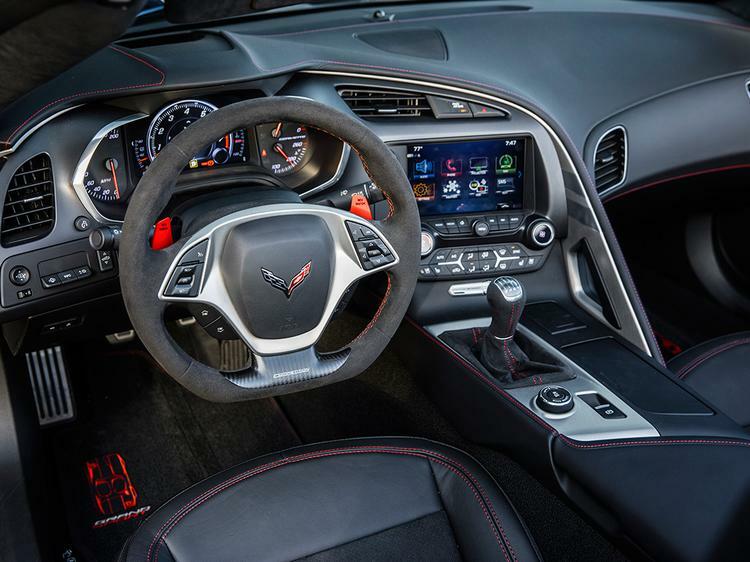 The cabin seems to be pretty much identical to that of the regular Corvette, which means it's good at making a first impression but with plenty of cheap bits when you start to look more closely. There's a big central touchscreen running GM's standard North American suite of apps, and a VDU rev counter that's flanked by a conventional speedo on the left and fuel and temperature gauges on the right, the brightness of the different sections not quite matching up. Patchy quality in here, but what a manual! Having (briefly) experienced a Z06 last year I was expecting the Grand Sport to feel a bit anemic, but it's anything but. The V8 pulls strongly pretty much around the clock; there's not the low down get-thee-gone shove that comes from forced induction, but it doesn't feel lacking below 2,000rpm, even when asked to pull the ludicrously long seventh gear. Yes, it's still got pushrods and two valves per cylinder, but dig deeper and it starts to feel properly serious. I don't remember the regular Stingray feeling this quick, with some properly outrageous noises coming from the quad exhaust tailpipes. It's not a revver, with peak power at 6,000rpm and the limiter calling time just 500rpm later, but it's definitely happiest when working the top quarter of its range. The car I drove had the Z07 pack, including some outrageously sized 335/25ZR20 tyres on the rear axle that'd put a road roller to shame. Despite the track-focused rubber and suspension it didn't feel anything like as compromised on road as circuit specials often do. Which was a good thing as I didn't have a track to go and play on, just the public roads around Chelsea in Michigan. By happy non-coincidence, these happen to be one of the favourite testing venues for GM's development engineers as well. The roads are certainly challenging, with some big cambers and poor quality surfaces doing a half-decent impression of a poorly maintained British B-road. 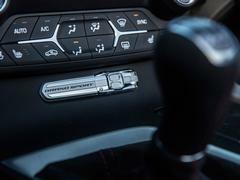 Yet thanks to the range of the switchable dampers, controlled by the rotary dynamic control switch with Tour, Sport and Track modes, it didn't feel harsh even at a fairly serious lick. It's definitely firmer than the regular Stingray, but also better lashed down over surfaces that would likely get its boggo sister feeling floaty. The steering is also crisper than the regular 'vette, with a searingly fast turn-in that takes a while to get dialled into. Grip is massive - but not too massive. Chevrolet claims the Pilot Sports are capable of delivering up to 1.2G of lateral grip on a dry surface, and they're more than sticky enough to allow the Grand Sport to carry huge speed everywhere. It takes the combination of a slow corner and deliberate throttle abuse to get the chassis to even admit it has limits, either through the angry strobing of the stability light or - with the system off - the sense of the back starting to shift. Like the regular Stingray it's not a drift machine, but despite the quantity of raw adhesion it never feels over-tyred or inert. The rest of it impresses too, certainly on its home territory. The optional carbon brakes are fine on road, working quietly and without any drama when cold. The manual gearbox is a peach too, probably the one area where U.S. sports cars are now clearly ahead of their European equivalents - both the weighting and action are pretty much spot-on. Crucially the rev-matching system can be turned on and off as well. Americans often complain about the awesome European market performance cars the motor industry denies them, from SEAT Cupras to Audi RS6s. With the recent death of the Dodge Viper the Corvette and its Camaro sister are the only real examples of when the tables get turned, and anyone dedicated enough can indeed buy one here. Would it really be worth the money over here? But to do so would be mad. Much as I like the Grand Sport in Michigan I know I'd like it a lot less in the UK, wearing what would probably be a £80,000 pricetag. But this could well be the last Corvette we're denied. Work is already advanced on the next car, which is going to be mid-engined and - you'd imagine - with its huge development costs offset by the need to broaden sales. With Ford showing the way with the right-hand drive Mustang let's hope that Chevrolet has the sense to follow. Oh, and not to try and stick Vauxhall badges on the finished car if it makes it over here. CO2: Are you, or have you ever been, a communist? Great Car, but sadly the UK Sports car owner only seems to like RHD! Time and time again I get this when people ask me about my car. Funny how they go to Europe and seem to cope with their RHD car! I like being different and have had a couple of Yanks in the UK and NEVER have had the perceived Problems Right Hand Drive owners think you will encounter. Price at the moment will make sales hard, but hopefully the Brexit thing will smooth over and the pound will fair better with the US Dollar. 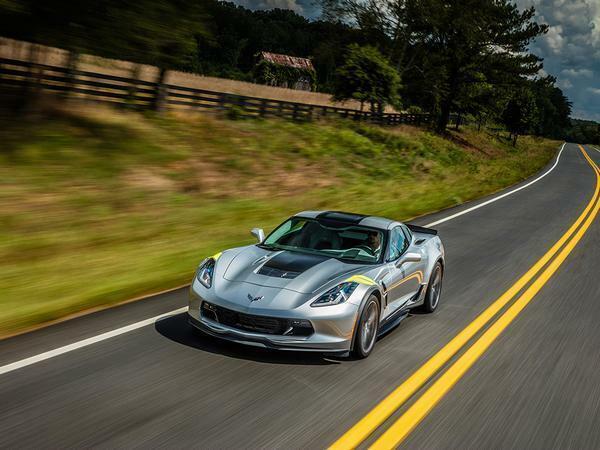 What is good is that Unlike Dodge, Corvette will back up warrantee work in Europe. I thought the yellow stripes down the side of the car were an interesting swooping extension of the two yellow stripes on the wing, but no, it's just the reflection from the centre-lines on the road. Over here, would these deter parking tickets? be that as it may I can see the vfm argument - to a point. Personally I prefer the look of it to a 911 and this alone could sway me - however there are other cars out there at this price point which I prefer even more so a moot point. I was looking at a 5th gen Camaro and was put off by the LHD of it for 2 reasons, first being overtaking on a busy A road where I'd presume I'd need to stick the car quite far out to see if it's safe, second was getting in and out of the work car park and the multi stories, etc. I'd need a designated passenger.